The valley and mountain station of the Karwendelbahn are great starting points for hiking tours. Depending on the snow condition these hikes are doable from May until October. On the border between Bavaria and Tyrol lies the breezy ridge of the Mittenwalder via ferrata. The path is rated as moderately difficult and is – with hiking gear – doable for beginners even though it is quiet long. There are several shorter via ferratas available for kids. The view into the valley is dizzyingly, the panorama breathtaking. The hike takes about 8 hours and needs to be avoided during thunder. Close by the mountain station are worthwhile hiking tours at the Karwendelkopf and the western Karwendelspitze. Tempting for alpine hikers are the classic routes and the new routes on the Viererspitze and the Krinner-Kofler-Turm. With alpine orientation they are within easy reach from the mountain station. A relaxed ride with the gondola into the valley sounds really inviting, after you’ve managed the classic route over the southwest ridge of the Gerberkreuz or one of the alpine sport hiking routes at the Gerberpfeiler. Around the Dammkarhütte hikers can find a changing terrain too, the degree of difficulty ranges from IV to VIII. 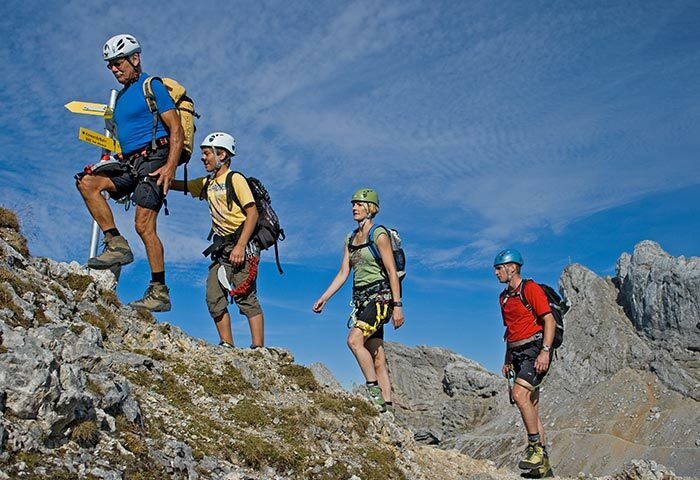 It’s best, if you get yourself the “Topos” from mountain sport and the “Mountain Guide Mittenwald”. Between valley and mountain station, about 20 minutes away from the Mittenwalder cabin you can let off some steam in the climbing garden “Rauchkopf”, where you can choose between 14 tours (difficulty ranging from III – VII). Mountain welfare!